Yet again, no spinning was done this week. I guess I really failed my February goal! 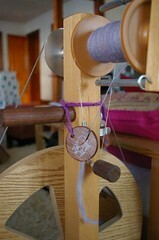 But all is not lost, there has been spinning related activity during these last few days. I walked into the little store just as they were opening. My eyes first saw the rovings, then they saw the yarn. There was also knitted items, pottery, jewelery, soaps, etc. This little store sells the wares of a dozen of local artisans as well as the farm’s yarns and rovings. They also sell machine knitted socks out of their yarn. I spoke to the owner for a bit. She sends her fiber off to be processed then dyes it herself. They do a few different yarn weights and carry a few other yarns like Schaefer, Hand Maiden and maybe a couple other brands. It’s 4oz of 70% Shetland and 30% Mohair. 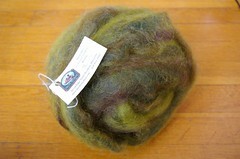 It is really hairy so it might be difficult to spin but we’ll see when I get there. I really liked the combination of the bright green and the brown. I received in the mail something I’d been wanting to buy ever since I first saw it on Chappy’s Mom‘s blog. It was the exact thing I’d been needing but didn’t know existed. It is a black walnut Lamb’s Tail Strandholder from Fibre Art. It holds your fiber when you are taking a break from spinning. 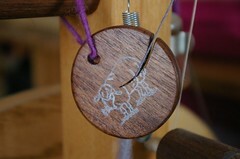 I like how it matches the darker wood part of my wheel and I love the sheep stamp on it! I think that as gadgets go, it will be really useful for me. I recommend it to anyone looking for something like that too! What a wonderful serendipitous store find!! And a wicked cool gadget too! 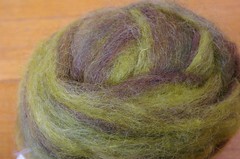 That roving is beautiful and it will look great spun up! How great to have stumbled upon that store! In September they have an open farm day and you can go and visit the animals. I love this store. It’s amazing how such a small area can be filled with such wonderful things.